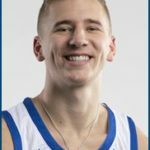 Drake senior guard Nick Norton’s will miss the remainder of the season after suffering a knee injury in Wednesday night’s Missouri Valley Conference opener. Norton suffered an injury to his left knee late in the first half of the Drake men’s basketball team’s double-overtime loss at Evansville while driving to the basket. Norton’s injury was evaluated Thursday and following an MRI, team physicians determined Norton tore the anterior cruciate ligament in his left knee. Surgery to repair the ligament will be performed at a date to be determined. The Bloomington, Illinois native transferred to Drake from Alabama-Birmingham and has been a key part of the Bulldog’s 11-3 start to the season. Norton averaged 14 points and six assists while shooting 40 percent from three point range and connecting on 92 percent from the foul line. Drake returns to Missouri Valley action on Saturday by hosting defending conference champion Loyola.